Nothing illustrates the decline of the canal system and its subsequent revival as part of the leisure industry better than this picture postcard from the mid to late 1960s, which we've taken from the Paul Hough Collection. The harsh winter of 1962-3 dealt a body blow to the canal carrying industry, with boats marooned in frozen waterways for weeks on end and precious revenue-earning cargoes having to be abandoned or very expensively transferred to road transport. The use of the canals for carrying goods more or less came to an end at that time, although a few traders carried on into the 1970s. Others began to look at the possibility of entering the new canal holiday industry. Ironically it was the semi-dereliction of the inland waterways at that time which attracted many people to them and there was a pioneering atmosphere in the early days of canal cruising which has now disappeared as the waterways have been smartened up, a better maintenance programme introduced, and new facilities added. A far cry indeed from the situation in the 1960s when people actually campaigned to have canals drained and filled in; something which would be unthinkable now. Our picture catches the Kings Lock pub in that period of limbo between the end of commercial canal carrying and the burgeoning leisure boat industry really getting into its stride. We've dated it as 'mid-to-late 60s' partly because of its general air of faded glory and partly because of the ICI buildings just visible to the left of the pub. The works closed in 1962 and these two buildings, along with many others, were demolished a few years later (a similar but larger building, out of shot to the left, was retained and put to use by Pochins Ltd when they took over the site at the end of the decade). So we think we're safe in dating the picture as we have. On the lockside, in front of the pub, can be seen a small brick building used by lengthsmen to store tools and materials for the maintenance of the canals. This building was later reduced in height and given a flat roof before suddenly disappearing altogether in the late 1990s, a few days before the Folk & Boat Festival one year. 'The little building on the lockside was originally a Toll house, which charged boats to go up 'Heart Break Hill' to Kidsgrove, where there is an identical building. When Billy Foden, the landlady, knocked it down, there was some confusion at British Waterways and a few days later a BW man arrived and asked for his shed back'. The Kings Lock is another one of Brian Curzon's 'stack pubs', built on two levels; in this case to provide stabling and other facilities for boatmen and their families at the rear of the building. Behind the pub's garden is a short length of canal which was built for industrial purposes but now leads to a boatyard, complete with slipway for the launching of new and repaired boats. The Kings Lock was always a boatees' pub, although it also enjoyed, and still enjoys, a lot of patronage from local residents. At one time it had just the tiniest of bars and a very small dining room but, in recent years, a genius of an interior designer has opened the place out and there is much more room than there used to be. In the 1990s a new bar was built in the shape of a Narrowboat, closely resembling the one at The Shroppie Fly at Audlem. 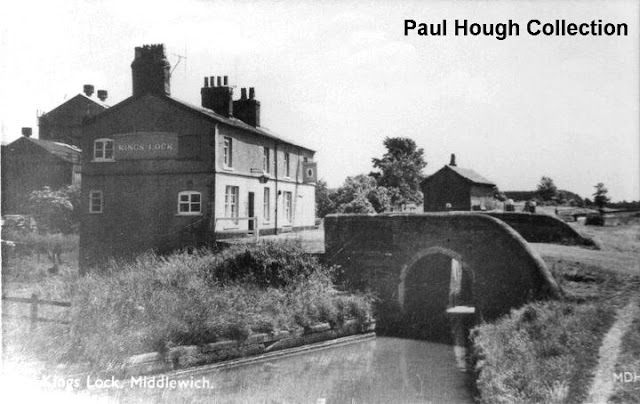 The Kings Lock today takes full advantage of the tourists who pass through Middlewich on the canals. It played a big part in the Folk & Boat Festival almost from the start, and is still a major venue for the Middlewich FAB Festival. Faded Glory. I remember the Ind Coope lantern above the doorway. You used to be able to go into the 'Off Sales', which was a small room to the left of the main bar, with a pop bottle and get it filled with a pint of bitter. There was an older gentleman in the Avenues who would ask this favour on occasions. His other passion was, "Wut gew get me a bottle o' 'orehound, lad?" Or lass, depending on which youngster happened by. He used to stand by his front gate, you see. A portly gent with a red face. I would say he lived at no. 28.